And indeed… I hit a snag along the road which initially prevented me from compiling 5.3.0 packages, but a patch was shared by orbea on the blog which pointed the way to solving my issue with harfbuzz. For your information, the Slackware version of harfbuzz is not compiled with graphite support (because Slackware does not have a package for graphite) and the new LibreOffice requires this – so my libreoffice package has to compile an internal version of harfbuzz. As said previously on the blog, the new LibreOffice 5.3 series introduces Collaborative editing which to me is the major highlight. A Docker image is available if you want to experience LibreOffice Online on your own private server. Better text rendering is another highlight, hence the new requirements for harfbuzz (which is used as the rendering engine). A detailed description of new features was made available as a web page: http://www.libreoffice.org/discover/new-features/. Get my fresh libreoffice packages for Slackware-current from a mirror like this one: http://bear.alienbase.nl/mirrors/people/alien/slackbuilds/libreoffice/. I also added LibreOffice 5.3.0 to a re-spin of my PLASMA5 Live ISO which I uploaded last night, so if you want to play with the new features in a safe environment, try it on Slackware Live Edition. I will write more about the new PLASMA5 ISO in another post. As a closing remark, I advise you to read the statement issued by the Document Foundation on the intentions of the Munich City Counsel to replace their version of Linux (LiMux) and LibreOffice with MS Windows 10 and MS Office by 2021. A sad example of how behind-the-scene lobbying of Microsoft and its partners is threatening to overturn one of the most well-known Open Source success stories in Western Europe. Hi! Is it difficult to involve graphite support also or it complicates the process too much? My LibreOffice package contains an internal copy of harbuzz which does have graphite support. to get that working, took me some time and it needed that patch orbea mentioned. Some of us already mentioned to Pat that graphite would probably be a good addition to Slackware itself. Hi Eric, thank you! The packages work very well so far, with the exception that OpenGL does not work in my box. Enabling OpenGL makes LO start and spontaneously close after the splash screen and before any window is displayed. 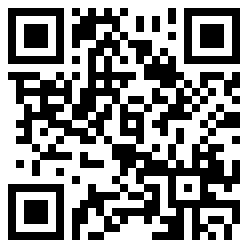 Otherwise it works like a charm (and the ribbon UI is awful but such is progress for many). Thanks again!! Thanks for bringing LO 5.3 to us, Eric. Upgrade itself went smooth. This happens regardless OpenGL is on or off. Have anyone seen a similar behavior? Tks for the feedback, @Eduardo. Very sad news at all. Can you compile LO 5.3 for Slackware 14.2? Or is there some issue? Mário I am not going to compile LO 5.3.0 for Slackware 14.2. Stick to a stable release on a stable OS please. 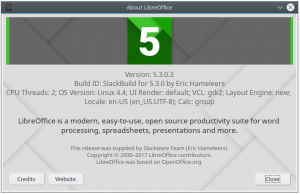 arkdetech – the main article above your comments states: this is Libreoffice 5.3 for Slackware CURRENT. You installed it on Slackware 14.2 which is not the same release. Installing a package on an older Slackware release which was compiled on a newer Slackware release, will not work!